Frome Renewable Energy Co-op (FRECo) has received £1,000 from Ready for Retrofit. 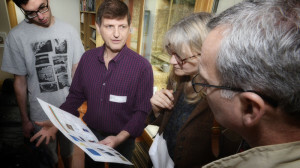 FROME Renewable Energy Co-op (FRECo) has received £1,000 from Ready for Retrofit, the programme that supports energy efficiency in social housing, businesses and the community. Under the scheme, run by the Energy Saving Trust, 14 groups will be able to run Energy Saving Open Homes Days and Energy Fairs throughout the year. Earlier events have proved to be very popular, attracting hundreds of visitors. FRECo are planning a follow-up to their recent very successful Open Homes event with a Big Green Energy Fair at the Cheese and Grain on 14th September. Frome Renewable Energy Co-op (FRECo) event organiser Anna Francis said, “We are looking forward to putting on a big event in September at the Cheese and Grain, which is itself a solar powered venue. We will focus on renewable energy, including biomass, solar – thermal and photovoltaic – efficient heat pumps, energy efficiency and much more besides. The £8 million three year Ready for Retrofit scheme funded by European Regional Development Fund (ERDF) is run by the Energy Saving Trust. It enables social landlords to apply for funding to retrofit energy efficiency and microgeneration measures to improve the energy performance of their homes. The programme also supports the local supply chain enabling businesses to become more competitive, improve skills and successfully achieve accreditations needed to bid for larger contracts. Jon Rattenbury, Ready for Retrofit manager said, “At Energy Saving Trust, we have been thrilled with the number of successful applicants. The response to these events, both from the local groups who have already received funding and from the wider community is always really positive. Hosted by the homeowners themselves, Open Homes Days inspire many visitors to introduce simple measures to reduce their energy consumption and bring down bills. They hear first-hand how they can save energy and money through retrofitting different measures or in some cases start micro generating their own power. Energy Fairs feature local businesses that supply energy efficiency and microgeneration products and services. Speakers provide information and demonstrations to visitors, who get the opportunity to find out simple tips and products that are easy to fit in their homes. Groups who successfully bid for funding received up to £4000 for an Open Homes event and up to £1000 to run an Energy Fair.